Since 2001 we have been trying to register LifeNets as an NGO (Non-Governmental Agency) in Malawi. We are already registered legally in South Africa, Zambia, Kenya and Ukraine. Being identified by the government has many advantages in our ability to work in those countries. It has taken longer to register in Malawi than usual, but finally the documents were signed by the Ministry of Justice on July 12, 2010. We are thankful to Wordsworth Rashid who is one of our representatives in Malawi for helping with completing the process. 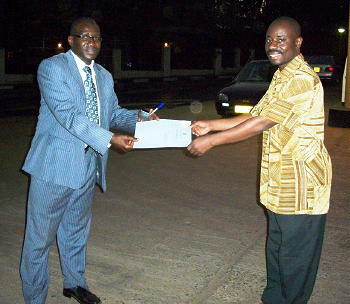 On the photo on right our attorney Chriss Tukula presents the registration certificate (below) to Wordsworth Rashid. 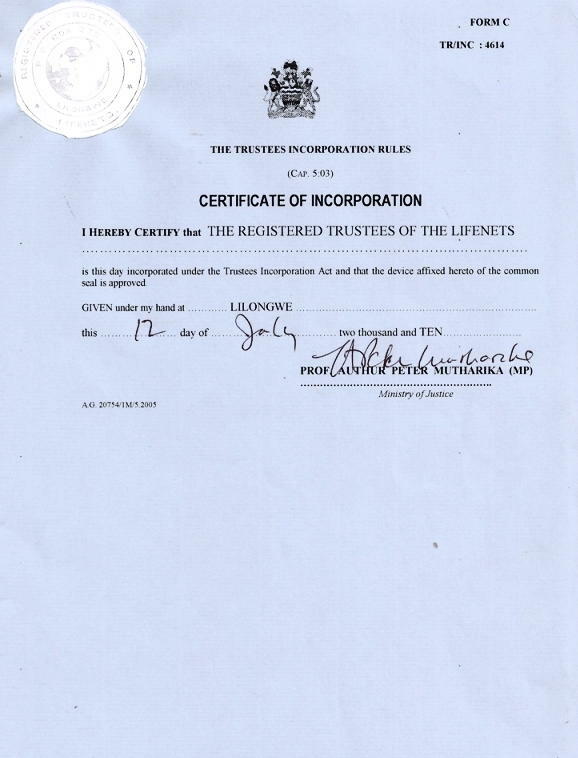 The current trustees of LifeNets here remains the same: Mr Salawila-Chairman, Wordsworth Rashid-Secretary, Lewis Salawila-Treasurer, Beverly Kubik-Member (Grant Coordinator) Cephas Chapamba-Member (as of September 6, 2010).